Dental Floss, Tongue Cleaner: Dr. Tungs, Pureline, Eco Dent, Radius! Neem Dental Floss Cinnamon helps support healthy teeth and gums with effective extracts of Neem Leaf and Bark. • Neem Floss Cinnamon: 50 yards. ORDER TODAY! • Neem Floss Mint:50 yards. ORDER TODAY! • Anti-Plaque Flat Floss Spearmint: Sturdy between teeth yet gentle on gums. Easy glide naturally waxed nylon filaments prevent breaking or fraying while removing particles effectively and thoroughly to help maintain teeth and gums healthy. 32 yards. ORDER TODAY! Ingredients: Beeswax, Carnauba Wax, Spearmint Oil Flavor, Jojoba Wax, Acacia Flavor, Myrrh Natural Resins, Propolis Natural Resins. • Smart Floss: Innovative Smart Floss Dental Floss is gentler on gums because it is cushion-soft and can stretch to clean better. Unlike those other flosses with no spring that can often hurt gums...and fingers! Smart Floss Dental Floss is clinically proven to eliminate up to 55% MORE plaque than regular flosses. Smart Floss can clean around the teeth and reach deeper into the interdental spaces, leaving teeth cleaner and you smiling longer! This high-performance floss is suitable for everyone - people with tight spaces, wider spaces...even braces. Natural Cardamom flavor for a brilliant fresh feeling! Lightly waxed with a natural blend of vegetable and bees wax! 30 yards. ORDER TODAY! ORAL CARE: Smart Floss, 30 yards. GentleFloss Premium Dental Floss: Helps reduce tooth decay, freshens breath,and gentler flossing. All natural essential oils and enzymes. Helps eliminate plaque. • Travel size, 40 yards: Reduces Tooth Decay. Freshens Breath and Gentler Flossing. Travel Introductory Size with All Natural ESSENTIAL OILS and ENZYMES. Helps Eliminate Plaque. 100% Vegan Waxed. ORDER TODAY! • Premium Gentle Floss, 100 yards: Reduces Tooth Decay. Freshens Breath and Gentler Flossing. No Plastic. Vegan Waxed. Recyclable and Biodegadeable. ORDER TODAY! • VegenFloss Cinnamon, 100 yards: Reduces Tooth Decay Mint Free! Freshens Breath and Gentler Flossing. Helps Eliminate Plaque. Cinnamon. 100% Vegan Waxes, No Beeswax and No Mineral Wax. ORDER TODAY! Ingredients: 100 % Vegan-Waxed Floss impregnated with Natural Menthol & Anethole, Oils of Peppermint, Lemon, Orange, Fennel, Anise,Geranium, Bergamont. Basil, Lavender, Rosemary and Rose, and a naturaly derived Enzyme System (water, potassium thiocyanate, lactoferrin, lactoperoxidase, glucose oxidase). • Vegan Cranberry Dental Floss: Cranberry is a natural source of phytochemicals which have been proven to stop unwanted bacteria clinging to surfaces. Cranberry acts as a natural inhibitor to plaque on the surfaces between teeth and helps prevent gum disease. Our completely vegan Cranberry Floss is spun from the finest grade nylon filament, then dipped in pure cranberry essence and coated in 100% pure, natural candelilla wax which is a plant based wax. No artificial sweeteners, color or flavor synthetic wax, GMO ingredients, preservatives, glutens or yeasts. 55 yards. BUY NOW! • Vegan Silk Dental Floss: 33 yards. BUY NOW! • Vegan Xylitol Mint Dental Floss: Our Vegan Xylitol Mint Floss is a super soft nylon floss, spun in Candelilla plant wax and is 100% Vegan. It contains Mint Tea Tree and natural, USA-made Xylitol for a clean, healthy mouth! It contains no glutens, preservatives, GMO's, artificial sweeteners or color, or fluoride. 20 pk sachets. BUY NOW! ORAL CARE: Dental Floss, 55 yds. • Dr. Tung’s Tongue Cleaner: World’s Best 'Bad Breath' Tool! Tongue Cleaning is the BEST remedy for bad breath, and Dr. Tung's is the #1 selling tongue cleaner! Why? Because like good silverware its made of STAINLESS STEEL (not plastic), and our curved cleaning edge removes bacteria and soft plaque in seconds! Cleaning your tongue is comfortable, quick and effective with Dr. Tung's. GUARANTEED! Modern research confirms that tongue cleaning is the best way to remove bacteria that cause bad breath. Tongue cleansing also helps improve taste, remove the coating on the tongue and slow the growth of plaque. Try our easy-to-use, stainless tongue cleaner with exclusive comfort-grip handles. • Snap-On Toothbrush Sanitizer: Toothbrushes harbor a host of harmful bacteria that can re-infect your mouth when you brush. Our Snap-On Sanitizer releases all-natural, anti-bacterial vapors to kill germs and safely sanitize your toothbrush between brushings. No mess, no fuss, dry vapor action. Fits most manual and power brushes. No electricity or batteries required. Ideal and convenient for home and travel. At least 60 days protection per sanitizer. FDA registered. 100% natural germ-killer. • Snap-On Toothbrush Sanitizer: Keeps your toothbrush hygienic and fresh. 2 ct. BUY NOW! • Kids Snap-On Toothbrush Sanitizer: Keeps your toothbrush hygienic and fresh. 2 ct. BUY NOW! ORAL CARE: Snap-On Toothbrush Sanitizer, 2 ct.
• Snoreclipse: Snoreclipse contains rare earth magnets that were carefully designed to apply a constant, gentle pressure on the nasal septum. This pressure increases circulation in the nasal area and promotes opening of the nasal passages. The opening of the nasal passages encourages relaxed breathing through the nose, which is very helpful in preventing snoring. Retraining the body to breathe through the nose in a calm, relaxed way is the objective. No drugs, sprays, adhesive strips or hard uncomfortable plastic clips. 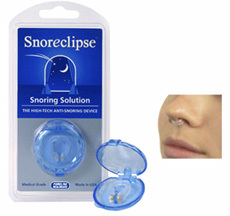 Make Snoreclipse the snoring solution for you or your loved ones and see what a difference quality sleep can make USA. ORDER TODAY! • Tongue Cleaner: The TONGUE CLEANER is scientifically designed to effectively clean the tongue, especially the important hard to clean rear dorsal portion of the tongue that is very susceptible to the accumulation of plaque during sleep. This effective cleaning removes the cause of the bad breath problem rather than simply treating the symptoms with mouthwash and breath aids. You remove the prime cause of bad breath, restore your taste sensation and improve your oral hygiene. Enjoy a clean, fresh, healthy mouth. You'll be amazed at how quick and easy The TONGUE CLEANER is to use. Once you have used it for a few days, you won't be without it. USA. ORDER TODAY! • Tongue Cleaner: While there are many tongue cleaners out there, Smile Brite (r) has the unique advantage of providing a patented tongue cleaning tool, with a tongue brush on one side, and a scraper on the other. You gently brush your tongue to loosen film and bacterial plaque from your tongue, then flip the tool over and scrape off the loosened residue. This provides you the absolute best tongue cleaning experience for the ultimate in oral hygiene. Smile Brite Tongue-Cleaner with its in-depth action effectively eliminates bacterial deposits and residues (i.e. tobacco, coffee, tea, alcohol) from the rough surface of the tongue, especially its dorsal part. Germs and diseases have no chance. Once you try our Smile Brite Tongue Cleaner you will never go back to any other style! ORDER TODAY! -- markedly improves your sense of taste. • Tongue Cleaner: Tongue Cleaner has a simple design and is engineered to efficiently remove bacteria 10 times more successfully than brushing alone. The ribs on the head scrape away the bacteria, and the curved, easy-to-grip handle allow you to access hard-to-reach spots. Completely recyclable after use. ORDER TODAY!